Gaots: Our family website. | Our website for sharing our family journey with friends and relatives. Elizabeth and I started this site to enable us to share our experiences as we have our first child. We both feel that over sharing of pictures and anecdotes on Facebook and other social networks is frankly not that great an idea, so we wanted a place where we could invite people to log-in and view photos, blog posts and other updates. In this way, we can share the right stuff with the right people! We’re looking forward to growing the site over the next few years and hope that you will enjoy it. Please feel free to contribute with comments as you feel appropriate. 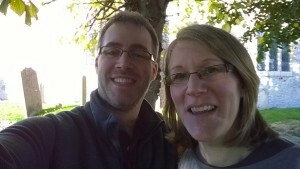 Our first ‘selfie’, taken on our 13th anniversary in October 2014, outside St Andrew’s Church, Farnham, where we were married!